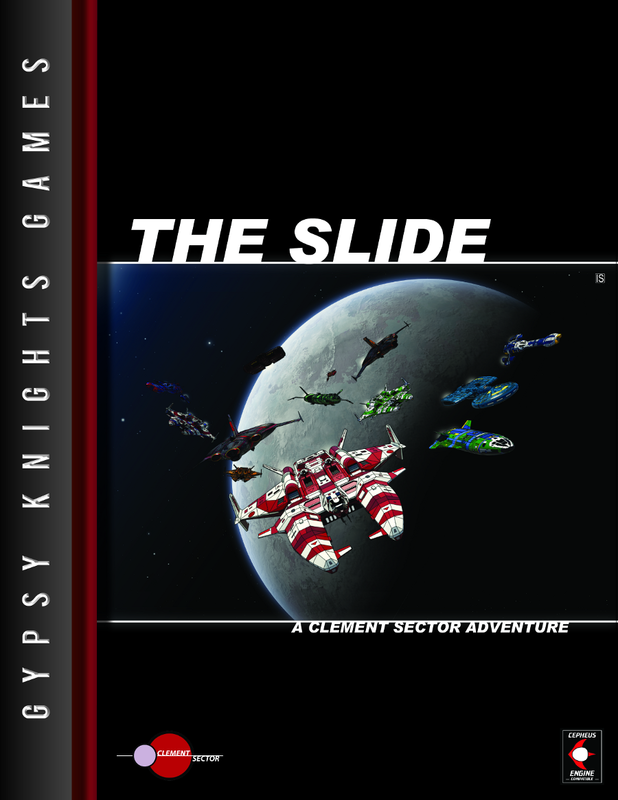 For this blog post, I’m going to take a look at a Gypsy Knights Games product recently published: ‘The Slide’. This is an adventure set in the Clement Sector and uses the Cepheus Engine rules set. The adventure premise is a race between pirate crews with a huge financial reward and the prestige of winning, for the victor. The Slide can be purchased from Drivethru RPG for $9.99 for which you get 103 pages of PDF. Written by John Watts with additional material by Curtis Rickman and Michael Johnson, the adventure has quite a simple aim for the characters; race (using starships) against other crews to be first to reach the set destination. Basically, anything goes; because you are racing against other pirate crews you can employ whatever tricks you want to stop the other crews getting to the finishing post before you. Along the route are a very limited number of populated worlds (well, …one) so there is a huge amount of risk in pushing your ship to its limits as any breakdown and you may end up stranded. This type of route challenges the players to make sure they make the right choices in managing their ships resources, dealing with fellow competitors and random / unexpected encounters. The first twenty or so pages are broken down into detailing the pre-generated characters for the ship featured. You get a pretty good set of stats and descriptive background for each character, along with an illustration. Following straight after the characters section, you get a set of ship stats, deck plans and background for a modified Jinsokuna Chirashi-class yacht, now known as a Vulture-class pirate marauder. The adventure then starts on page 22, located on the planet Refuge. You are up against a number of other crews (I’m not going to reveal how many for giving the game away…) and have to simply be the best in the race. Some referees may expect to see quite a structured approach to the adventure, in that you travel to one world, have encounter ‘a’, deal with that then travel to world 2, have encounter ‘b’ and so on. That’s not how The Slide is written; its very open ended and in some ways, the adventure structure is very simple and short. However, I think that is its strength in that you are not railroaded into a set story (eg. like the ‘Dragonlance’ series in D&D) and you have free rein to find your own route. The referee will have other ideas of course and will use all the crews in their disposal to try and stop the players. The referee is given some guidance on running the adventure, some ‘dirty tricks’ that crews may employ and some random encounters. To support the adventure, the next section (well, the remainder of the book) contains sub-sector maps and descriptions of worlds that lie along the route. You have a colour planet and system map, stats, description and notes of interest. There are some worlds that could put the players off the lead in the race; again, I won’t go into exactly what but there is enough information to help the referee set things up, but not too much information that there is a huge amount of structure to stick to. The book is copiously illustrated by Ian Stead, Bradley Warnes and Michael Johnson, I especially like the pre-generated character profile illustrations by Bradley – there are some really nice quality images for each character. There should be more than enough to keep the players occupied, there are plenty of encounters to be had, worlds to explore (I mean get distracted by) along the route and the prospect of a huge cash payout should be enough to keep them motivated. There are some interesting crews the players are competing against, plenty of scope to establish some long-term rivalries should the players win…! Despite its simple premise, The Slide is a well-written, packed open-ended adventure which gives the referee tons of scope for setting up plenty of sub-plots and alternative adventures. The sub-sector information should be more than enough to allow the referee to reuse the book, so I consider this a high-value ‘essential’ purchase for adventuring in the Clement Sector. I would like to thank John Watts of Gypsy Knights Games for kindly sending me a copy of The Slide to review. This entry was posted in Cepheus Engine, Mongoose Traveller, OGL and tagged Cepheus Engine, Clement Sector, Gypsy Knights Games, Mongoose Traveller, Supplement, The Slide. Bookmark the permalink.